28 JUNE – 11 AUGUST, 1922. For our purposes, the military significance of the Irish Civil War is that it witnessed the birth of the Irish Defence Forces, an army that has distinguished itself outside of its homeland through extensive service in various U.N. Peacekeeping operations. (3) Conversely, it was also a decisive turning point in the history of the Irish Republican Army (I.R.A.). (4) The Civil War was the only conflict in Ireland during the twentieth-century that involved an extended period of conventional fighting and, while it certainly did not serve as a model for innovation, the conduct of the war by both sides at least reflected a number of important military trends that would decisively shape operations in the Second World War. Although this paper will focus on the military aspects of the war, consideration must first be given to the complex political aspects that led to the outbreak of the war and provided the motivations of the opposing sides. On 11 July, 1921, a Truce came into effect ending the Irish War of Independence which had lasted for over thirty months. (5) While the war had succeeded in forcing the British to the negotiating table, it had also exposed serious divisions within the nationalist movement, divisions that would only be exacerbated by the efforts to reach a lasting peace with Great Britain. The war had begun in the wake of the overwhelming success in the general election of December 1918 of ‘Sinn Fein’, the nationalist political party founded by Arthur Griffith. Following party policy, the Sinn Fein candidates who had been elected to parliament in London abstained from attending and, instead, formed their own legislative body, known as the ‘Dail Eireann’, headed by Eamonn de Valera as President. The Dail ratified the declaration of a Republic made during the 1916 Easter Rebellion and sent a delegation to the Paris Peace Conference to obtain support for Irish independence. (6) However, the I.R.A, which was nominally subordinate to the Dail, initiated their own efforts to win independence through military means without bothering to consult the Dail, efforts that began the war with Britain in January, 1919. Nothing could better illustrate the different philosophies of the opposing traditions that made up the movement for independence in modern Irish history than these divided efforts. Essentially the struggle for independence had been pursued through two opposite, often antagonistic, traditions; the ‘Constitutional Tradition’, which sought to use peaceful political means, and the ‘Physical Force Tradition’ which sought to win freedom through military action. (7) The Civil War would largely be a struggle between these opposing traditions. Just as the I.R.A. was critical of the Dail, the units in the field were critical of the G.H.Q. The nature of a guerrilla war waged by a clandestine force in a rugged country such as Ireland led inevitably to the remoteness and independence of local I.R.A. units from the G.H.Q. in Dublin. (11) As Ernie O’Malley, Commander of the 2nd Southern Division, noted, “G.H.Q. issued general instructions, but our operations were our own.” Liam Lynch, Commander of the 1st Southern Division, was less charitable; “[G.H.Q.] showed all-round inefficiency, and gave very little help to the country.” (12) These antagonisms would have serious consequences following the conclusion of the war with Britain. The actual fighting in the war was for the most part limited to the southern province of Munster and Dublin city. With the approach of formal negotiations to draw up an Anglo-Irish Treaty, De Valera decided to remain with the Dail in Dublin and, in his place, appointed a delegation of five members, headed by Michael Collins and Arthur Griffith. His insistence that any settlement should be referred back to the Dail before it was signed was contradicted by his bestowal of full plenipotentiary powers on the delegation. Negotiations lasted from 11 October until the final day of 5 December without producing a settlement acceptable to both sides. (17) Under pressure from his own party, Lloyd George presented the Irish delegates with an ultimatum; sign the Treaty as it existed or face the renewal of ‘immediate and terrible war’. (18) They were given two hours to decide. Collins and Griffith concluded that, regardless of the inevitable opposition of the Dail Cabinet under De Valera and the I.R.A., the Treaty was the best that could be obtained from Britain at that time and that it was likely to receive the support of the Irish people. Thus they exercised their plenipotentiary powers without consulting Dublin. The Treaty not only split the Dail, but the party of Sinn Fein and the I.R.A. as well. (23)Ironically, the most publicly outspoken critic of the Treaty, De Valera, was in reality the least important (all the more so when, at the head of the opponents of the Treaty, he left the Dail in protest three days after its ratification). Rather, it was the rejection of the Treaty by the majority of the I.R.A. that threatened the outbreak of civil war. Despite such provocations and other crises brought on by opposing units attempting to occupy barracks throughout the country that were being evacuated by the British, six months passed between the signing of the Treaty and the outbreak of the Civil War (see Appendices A and B). (33) This was a reflection of the sincere reluctance of former comrades in arms to come to blows. Shortly after the general election the events that would force the outbreak of war began in London. On 22 June Gen. Sir Henry Wilson, the security advisor for the new state of Northern Ireland, was shot dead by two I.R.A. men outside his home. Although evidence pointed to Collins’ involvement, the British government chose to use the incident as an excuse to demand action from the Irish government against those who opposed the Treaty, specifically the men in the Four Courts. (36) Initially Collins told the British Government that they could do their own ‘dirty work’ and Gen. Nevil Macready, C-in-C of British Forces in Ireland, was ordered to attack the Four Courts on 25 June (see Appendix C). Fortunately for the supporters of the Treaty on both sides of the Irish Sea, Gen. Macready backed down at the eleventh hour. But it was now clear that the British would not remain patient for long. Collins had always supported the Treaty as a means of achieving the removal of British troops. Now the opponents of the Treaty threatened to keep them from leaving, either because they would be used to eliminate their presence in the Four Courts, which would re-ignite the war between Britain and Ireland, or through provocation on their own by attacking British troops, which would produce the same results. (37) Griffith and the other politicians had wanted to act against the anti-Treaty I.R.A. as far back as March, but they were forced to wait for the loyal military to build up its strength. (38) Now the Provisional Government not only had a popular mandate from the electorate, but the anti-Treaty forces had provided it with two further advantages. On 18 of June, during a meeting of the Army Executive, a disagreement arose between the anti-Treaty leaders in the Four Courts and those outside of Dublin, causing a temporary split that isolated the Four Courts garrison. (39) Although Collins had probably come to a decision over whether to attack the Four Courts by 26 June, the leaders there handed him an excuse that served to mask the pressure from London when, in retaliation for the arrest of one of their officers, they kidnapped the popular Assistant-Chief-of-Staff, J.J. ‘Ginger’ O’Connell on 27 June. (40) That same night troops loyal to the government were ordered to take up positions around the Four Courts. Following the failure to respond to an ultimatum to evacuate the building, artillery opened fire on the Four Courts, beginning the Irish Civil War at 4:15 Am. on 28 June. THE OPPOSING FORCES OF THE CIVIL WAR. The military situation at the outbreak of the Civil War did not appear to favor the Free State. (42) Although roughly seven out of a total of sixteen I.R.A. divisions remained loyal to the G.H.Q., the size of these units varied enormously. The two largest divisions for instance, the 1st and 2nd Southern under two staunch Republicans, Liam Lynch and Earnie O’Malley respectively, contained a third of the I.R.A.’s total force (see Appendices D and G). In sheer numbers, the Free State Army was outnumbered by odds of more than two to one. (43)Moreover, the majority of the most active units of the War of Independence and, thus, the most experienced troops, supported the cause of the Republic. (44) In terms of deployment, Republican forces dominated the provinces of Ulster, Connacht, and Munster; three-quarters of the country. Although Free State forces were predominant in the province of Leinster, the majority of the troops in the Dublin Brigades were Republican. If the government lost the capital, the Republicans would have won the war in a single stroke. The I.R.A. formed the basis for the armies of the opposing sides during the war. Although its membership was quite large, only a fraction of these were veterans of the full-time Active Service Units (A.S.U., also known as ‘Flying Columns’) that had done most of the fighting in the war with Britain. (50) In addition, a large number had joined following the Truce, and were derisively known as ‘Trucileers’. (51) Because the Free State forces were seriously outnumbered, they began recruiting even before the outbreak of the war. Their most reliable unit, which would help decide the contest in Dublin and provide shock troops for operations throughout the country, was the ‘Dublin Guard’. It originated from the Dublin city A.S.U. – fifty men under Paddy O’Daly – which had worked closely with Collins. When the Guard took possession of Beggar’s Bush Barracks in Dublin on 1 February, they were a Company sized unit. By May they had expanded to the size of a Brigade. (52) With the Dublin Guard and those I.R.A. units in the field who supported the Free State serving as a foundation, the government sought to expand the Army following the outbreak of the war. Discipline was further threatened by the conflicting motives and loyalties of the opposing troops. When the war broke out, many I.R.A. members joined one side or the other merely on the basis of which group of comrades they happened to run into first. Personal loyalties often played a more important role than ideology, as suggested by the close ties of the Dublin Guards with Michael Collins. (59) ‘The Big Fella’s’ charismatic personality was a critical factor in retaining the allegiance of many I.R.A. commanders and their units, which is one of the reasons why he took up the position of C-in-C of the Army. (60) On the other hand, many if not most of the wartime Free State recruits joined the army to escape widespread unemployment, which was further aggravated in Ireland by the Civil War itself. (61) In any case, allegiances remained uncertain throughout the war. It was not uncommon for units to switch sides and mutinies to break out. Indeed, the attack on the Four Courts was delayed when a group of forty Free State troops mutinied. (62) While most mutinies broke out over the issue of back pay, the Republicans made a conscious effort to infiltrate the Free State Army and foment unrest. (63) Adjutant General Georoid O’Sullivan commented, “At the time we were in Beggar’s Bush I did not know but the man in the next office would blow me up…”(64) Because loyalties were confused, men on both sides were initially reluctant to fire on old comrades. (65) By the end of the war, however, acts, official or otherwise, were being committed by both sides that would have been unthinkable at its outbreak. The opposing armies began the war only partially equipped, but, in contrast with the Republicans, this situation improved enormously for the Free State (see Appendix J). While it was estimated that the Republicans began the war with as little as 6,780 rifles, the Free State had received delivery from Britain of 27,400 rifles, as well as 249 machine guns, by 2 September. (66) The Republicans only source of arms was either those captured from the enemy (or supplied by turncoats) or through the arranging of covert shipments from abroad, an option that was not helped by the Republicans’ financial difficulties and the coastal patrols conducted by British and Free State naval forces. (67) Although a variety of firearms were used on both sides, the principle infantry weapon became the .303 Lee Enfield rifle. Training was rudimentary, as is indicated by Gen. Mulcahy’s comment that, “Men were taught the mechanism of a rifle very often on the way to a fight.”, a state of affairs that applied to both sides. (68) The Irish Civil War was the first conflict to see the widespread use of the Thompson submachine gun. (69) Heavier squad level support was usually provided by a Lewis machine gun. The war saw the extensive use of armored cars and armored personnel carriers (see Appendix K). While the Free State obtained their vehicles from Britain, the Republicans were characteristically forced to rely on capturing equipment and even constructed a number of improvised armored cars. The most common vehicle was the Lancia armored personnel carrier (APC); an open top armored truck that had been constructed for the Royal Irish Constabulary during the War for Independence. Some, nicknamed ‘Chicken Coops’, had been fitted with wire screens to protect the open top from grenades. In order to increase the number of armored cars available to the Free State Army, sixty-four Lancias were provided with armored roofs and armed with a single Lewis gun. They received the colorful nickname of ‘Hooded Terrors’. The best armored car that was used in the war was the reliable 1920 pattern Rolls Royce, which the Irish troops christened ‘Whippets’. Armed with a water-cooled Vickers heavy machine gun in a revolving turret, it could provide sustained fire with devastating results. The Free State also employed a few heavier dual-turret Peerless armored cars. (70)Again, training was rudimentary; the usual method of aiming was to open the breech and sight the target through the barrel. (71) Regardless of the skill with which it was used, artillery proved to be the deciding factor in virtually every major engagement of the war. (72) Only too late did the Republicans realize its value, though even when they obtained an 18 pdr. after the recapture of Dundalk on 14 August the lack of trained personnel, along with the difficulties of transportation and ammunition led them to disable and abandon the gun. (73) Nevertheless, in October Chief-of-Staff Liam Lynch proposed that artillery be purchased from abroad. By January Lynch had settled on a fantastic plan for obtaining in Germany sixteen mountain guns and four heavy guns. 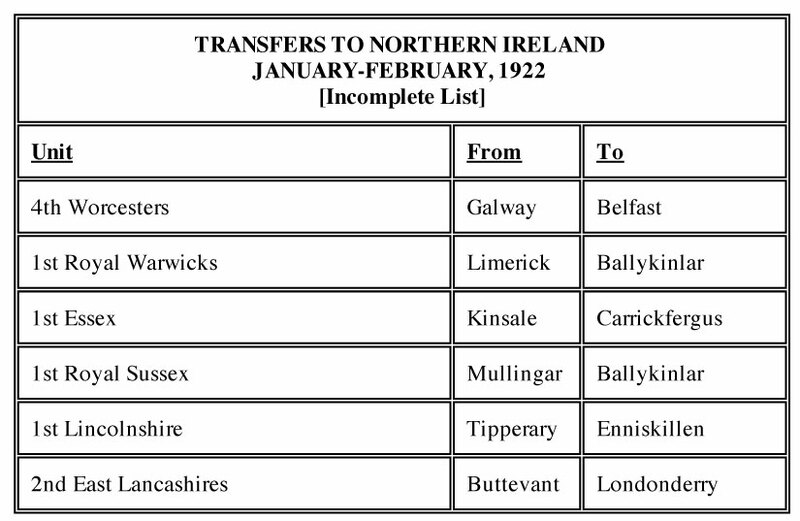 They would be landed, along with 100 or more English speaking instructors, in Munster (later, because of naval patrols, Lynch suggested delivery should either be by submarine or air!) (74) The only notable result of this scheme occurred in May, when Republican representatives made contact with an obscure politician in Munich named Adolf Hitler. (75) The artillery scheme only serves to illustrate how terribly ignorant the Republican military commanders were of the nature of conventional warfare, a fact that would haunt them throughout the course of the war. THE MAJOR CAMPAIGNS OF THE CIVIL WAR, June-August, 1922. When the Free State Army began its attack on the Four Courts building the garrison was commanded by Comdt. Paddy O’Brien, but the building also contained twelve members of the Army Executive, including Chief-of-Staff Joe McKelvey, Director of Engineers Rory O’Connor, and Quarter Master General Liam Mellows. (76) The defenders had prepared the enormous complex as best they could with sandbags, barbed wire, trenches dug behind the gates to prevent Free State armored cars from rushing the courtyard, and mines planted on Inns Quay in front of the building. (77) The garrison consisted of roughly 180 men drawn from the 1st and 2nd Battalions of the 1st Dublin Brigade, armed with Lee Enfields, Mauser carbines, at least five Thompsons, two Lewis guns, and the Rolls Royce Whippet ‘The Mutineer’. Gen. Tom Ennis commanded the Free State forces involved in the attack, which consisted of troops from his own 2nd Eastern Division and the Dublin Guard under their Brigadier, Paddy O’Daly. At this time the total number of Free State soldiers stationed in Dublin may have numbered as much as 4,000. (81) They were directed to take up positions in the buildings surrounding the Four Courts complex, including the Four Courts Hotel, Chancery Place, and Bridewell Prison. Snipers were stationed in Jameson’s Distillery and the bell tower of St. Michan’s church. The troops would be supported by two 18 pdrs. under the command of Gen. Emmet Dalton and Col. Tony Lawlor. (82) Lancia APCs were parked in front of the gates and disabled to prevent ‘The Mutineer’ from making sorties against the gun crews. (83)Gen. Dalton stated, “It was my belief at the time that the use of these guns would have a very demoralising effect upon a garrison unused to artillery fire, but I realized that their employment as a destructive agent on the Four Courts building would be quite insignificant.”(84) Neither of these assumptions would prove true. The artillery, stationed across the Lifey on Winetavern Street, opened fire at 4:15 a.m. on Wednesday morning, 28 June. As they fired at fifteen minute intervals, the Republican garrison responded in kind, forcing Gen. Dalton to bring in Lancia APCs to shield the gun crews. (85) The southern wing of the building sustained damage, but as the day wore on it became increasingly apparent to Gen. Dalton that the guns were not having the required effect. One or more guns were moved to Bridge Street to fire across the Lifey against the western wing of the Four Courts, while other guns on Chancery Street were trained on the Records Office behind the western wing, which the Republicans had converted into a munitions factory. (90) By nightfall both sections had been badly damaged, leaving a sufficient breach in the western wing. Storming parties from across the Lifey, along the Quays, and in the surrounding buildings rushed the Four Courts under the cover of rifle and machine gun fire. Just before the attack, Comdt. O’Brien had decided to withdraw the section from the Records Office, but before any orders could reach them a storming party led by Comdts. McGuinness and O’Connor fought their way into the building and captured all thirty-three of its defenders. The detachments advancing along the Quays were not as lucky. The garrison’s Lewis guns kept up a steady fire, wounding Comdt. Joe Leonard. Comdt.Gen. Dermot MacManus, a veteran of Gallipoli, took his place and joined Gen. Dalton in leading troops into the breach. Inside the Four Courts a barricade was erected in the center of the building below the dome using furniture and barbed wire. ‘The Mutineer’ drove back and forth, strafing the side of the west wing facing the courtyard. But the garrison’s situation was clearly deteriorating. Comdt. O’Brien had hoped that the men of the 1st Dublin Brigade would have broken the siege by now, but the majority had inexplicably taken up position on the eastern side of O’Connell Street; over four blocks away and on the wrong side of the widest street in Dublin. Various plans for escape where suggested, but the Army Executive vetoed them all. Early Friday morning Comdt. O’Brien was wounded by shrapnel, so that Ernie O’Malley took command of the defenses. The fighting in the morning was interrupted when a cease fire was declared so that the wounded could be evacuated. (92) Afterward fighting recommenced, with ‘The Mutineer’ continuing to pepper the Free State foothold in the corridors of the west wing. Comdt.Gen. MacManus returned fire with a Lewis gun and managed to damage the tires, so that the crew chose to abandon their vehicle. By now the shelling had ignited serious fires that were burning throughout the complex. (93) Around 11:30 a.m. an enormous explosion erupted from the Records Office when the fire finally reached two truck loads of gelignite in the munitions factory. A towering mushroom cloud rose 200 feet over the Four Courts. Against his own preference for guerrilla tactics, Comdt. Oscar Traynor had decided to hold a number of defensive position within the capital until reinforcements could arrive from the country. On Saturday, 1 July the Free State forces that had captured the Four Courts were redeployed to deal with Republican positions throughout Dublin. Isolated posts, particularly those south of the Lifey, were brought under attack. The Republican troops in the Swan Pub, for instance, were driven out by fire from the Rolls Royce Whippet ‘The Fighting Second’ commanded by Paddy Griffin. By Sunday the Free State had taken a total of 400 prisoners. (98) These successes allowed Gen. Tom Ennis to concentrate his efforts against ‘The Block’ and its surrounding posts. He ordered that a cordon be established around the area to isolate the Republican forces. The futility of holding fixed positions against superior firepower was becoming increasingly obvious. Therefore Comdt. Traynor ordered most of what remained of the 1st Dublin Brigade to make their escape as best they could, while a token force would remain behind to keep the Free State forces occupied. Monday night seventy men and thirty women evacuated ‘The Block’, which was to be held by fifteen soldiers under the command of the Republican firebrand, Cathal Brugha. On Tuesday Rolls Royce Whippets were used to provide covering fire for detachments of engineers, who drove up in front of the buildings in ‘The Block’, planted incendiary bombs on the ground floor, and then sped away. In response to Comdt. Traynor’s plea a Republican relief force had gathered in Blessington, fifteen miles south of Dublin, by Saturday, 1 July. (104) However, before a drive on the capital could commence a message arrived from Comdt. Traynor in which he ordered them neither to march on Dublin nor defend Blessington if attacked. Both sides in the war appreciated the strategic significance of the city of Limerick. As early as February a military confrontation over the occupation of the city had nearly resulted in the outbreak of war. Gen. Michael Brennan, commander of the only major pro-Treaty unit west of the Shannon river, the 1st Western Division in Co. Clare, stated succinctly, “Whoever held Limerick held the south and the west.” (111) GHQ feared that, with control of Limerick, the Republicans would be able to consolidate their hold on the south and the west, freeing up forces to drive on Dublin (in fact, Lynch had adopted a purely defensive strategy, but such a possibility in the future was not out of the question). Like so many other Southern Irish cities and towns, Limerick contained positions held by both sides. The Republicans controlled the four military barracks, with their headquarters in the New (Sarsfield) Barracks, along with the two bridges that spanned the Shannon river. The government forces, consisting of elements of the 4th Southern Division under Comdt.Gen. Donncada O’Hannigan, held the Customs House, the Jail, the Courthouse, Williams Street R.I.C. Barracks, and Cruises Hotel. G.H.Q. ordered Comdt.Gen. Brennan to deploy elements of his 1st Western Division to reinforce Comdt.Gen. O’Hannigan. Gen. Dermot MacManus was sent by G.H.Q. to investigate the situation in Limerick. Upon his arrival he repudiated the agreement of 4 July, though he soon began to see things from Comdt.Gens. O’Hannigan and Brennan’s point of view. Although he wanted to drive the Republicans out of the city as soon as possible, he recognized the weakness of the Free State position, writing to G.H.Q., “Unless rifles and armoured cars arrive within 24 hours of now, 10 a.m. 6/7/22 we will be in very grave danger of disaster.” (118) Disaster, however, was averted the following day when the commanders of the opposing sides signed another truce. Although he remained suspicious, Gen. MacManus was forced to accept the need for a truce so that additional men and equipment could be brought to Limerick. (119) Consistent with his notion of a ‘Munster Republic’ as a stumbling block to the establishment of a Free State, Lynch hoped to limit the scope of the war with his truce, thus providing the potential to negotiate with the government for the rejection of the Treaty. Other Republican leaders, however, wished to pursue military victory in the war and recognized that any truce would favor the Free State position, both in Limerick and in the country as a whole. It suited the Free State commanders in Limerick to formally end the truce on Tuesday, 11 July, when 150 troops, along with a consignment of arms, arrived from Dublin. (121) Before the renewal of fighting Lynch transferred his headquarters to Clonmel, remarking in a letter to Ernie O’Malley, “The second agreement reached at Limerick has been broken by the enemy…I believe…we will eventually…have to destroy all our posts and operate as of old in Columns.” (122) The Chief-of-Staff’s lack of resolve did nothing for the morale of the Republican defenders of Limerick. Seamus Fitzgerald of the East Cork Brigade complained, “At no time did I see a plan of attack. We never took proper control of communications. There was a complete absence of organised military efficiency [in Limerick].” (123) When suggestions were made that the routes by which Free State reinforcements were reaching the city should be attacked, they were vetoed on the grounds that it would weaken Republican positions within Limerick itself. (124) But despite confusion and adherence to a passive strategy, the Republican forces in the city maintained a stubborn resistance. By 5:00 p.m. on 11 July Free State forces had occupied additional positions and, at 7:00 p.m. hostilities commenced when troops on Williams Street opened fire on the Republican held Artillery Barracks. (125) Williams Street served as the Free State’s front line, with the Republicans in control of the majority of the city located south of this position. The government position on Williams Street was centered on the R.I.C. Barracks, with strongpoints north of this position in the Customs House and the Courthouse. Farther north, however, the Republicans occupied Castle Barracks, located next to the thirteenth century King John’s Castle, as well as the Strand Barracks across the Shannon river. (126) Streets were barricaded, and snipers ranged from church belfries and upper floor windows. The fighting largely consisted of small scale sallies made by both sides against their opponent’s strongpoints. (127) Needless to say, it was the civilians who suffered the worst: business was brought to a standstill and food became scarce. Republican positions in both the Strand Barracks and King John’s Castle, involving armored cars, grenades, machine gun and mortar fire. However, no progress was made. (128) The thick walls of the military barracks occupied by the Republicans demanded the use of artillery, a conclusion that G.H.Q. eventually reached. On Monday, 17 July, Gen. Eoin O’Duffy left Dublin to assume personal control of operations in Limerick and beyond. He brought along a convoy under Comdt. Denis Galvin that included a Whippet armored car, two Lancia APCs, four trucks carrying troops, 400 rifles, ten Lewis guns, 400 grenades, and, most important of all, an 18 pdr. field gun. Gen. O’Duffy established his headquarters north of the city in Killaloe. (129) Alerted to the imminent arrival of substantial Free State reinforcements, the Republicans launched an all-out attack on Tuesday in an effort to drive the enemy out of Limerick. Despite suffering substantial casualties, the government troops held their ground. The following day, Wednesday, 19 July, O’Duffy’s 18 pdr. was positioned on Arthur’s Quay, directly across the Shannon from Strand Barracks. The garrison refused the offer to surrender and the firing began. It took nineteen shells to breach the four foot thick walls, but the garrison remained defiant. The gun was moved across the Shannon where, after firing fourteen more shells, a breach in the rear of the building was made by 8 p.m. Meanwhile, the Republicans in the city had launched a major attack to rescue the Strand Barracks. Elsewhere in the city government troops struggled to take control of Republican positions, as fighting lasted throughout the night and continued on into the next day. Opponents exchanged fire across Williams Street from the buildings on either side. A particularly fierce battle developed for O’Mara’s Bacon Factory on Roches Street which could have easily been resolved, had not the 18 pdr. been committed to an attack on the Castle Barracks. The Castle Barracks were soon ablaze, though whether this was due to the shelling or the retreating garrison is not clear. By Thursday, 20 July, it was obvious to the Republican forces that their positions in Limerick could no longer be held. At midnight they set the Artillery and New Barracks on fire and began their withdrawal, leaving by Ballinacurra Road for Mallow and Fermoy (to where Lynch had moved his headquarters once again on 15 July). The battle for Limerick had produced surprisingly light casualties: eight Free State soldiers killed and some twenty wounded, while an estimated twenty to thirty Republicans were killed. (131) Heavier casualties, however, would be sustained during the Free State advance south of the city. While the Free State forces were engaged in clearing the western end of the ‘Limerick- Waterford Line’, progress was also being made on the eastern end. Shortly after becoming C-in-C on 13 July, Michael Collins outlined a plan for an attack on the city of Waterford by the forces in Kilkenny under Maj.Gen. John T. Prout. (132) Waterford looked to be a difficult objective to capture. Collins ordered troops from the Thurles-Templemore area and the Curragh to reinforce Maj.Gen. Prout (although the latter never reached him), bringing his forces up to a total of between 600 and 700 men. (134) Drawing on the information gathered in a personal reconnaissance by Col. Tom Ryan, Maj.Gen. Prout’s 2nd in command, Col. Patrick Paul, produced three alternate plans: to cross up river to attack the Republican left flank, to cross down river and attack their right flank, or to assemble a column composed of three or four Whippet armored cars in the lead, followed by a number of trucks carrying infantry, that would rush the bridge, securing it before it could be raised. At 10:40 a.m. on Wednesday the modest barrage commenced. Col. Paul’s initial attempts to shell the city with indirect fire from the reverse slope proved useless, so he brought the gun up to the crest of the hill, where it drew fire from the Quays. Huddled behind the gun shield, Col. Paul directed the gunner to shell the Infantry Barracks, Ballybricken Prison, and the Artillery Barracks. Using the twin towers of the prison as a guide, a few shrapnel shells were fired to adjust their aim before they began raining high-explosive shells down upon the Republican strongholds. To Col. Paul’s embarrassment, one shot fell short of the Infantry Barracks and hit his own home. Nevertheless, enough shells reached the target to convince the enemy that they were under attack from a battery of four guns. For their part, the Republicans had pinned their hopes on a plan to launch a surprise attack on Maj.Gen. Prout’s troops. Comdt.Gen. Denis Lacy had assembled a force to the west of the city in Carrick-on-Suir that consisted of three columns of fifty men each: one from Cork under Jim Hurley, one from South Tipperary under Michael Sheehan, and one from Kilkenny under Andrew Kennedy. They made their way to Mullinahone, where they were joined by 100 men under Comdt. Dan Breen. They pressed forward towards Mullinavant, from where it was intended that Jim Hurley’s column would attack the Free State troops on Mount Misery from behind, while the other two columns would take up defensive positions to guard against government relief forces coming from Kilkenny. Comdt. Breen’s force would remain in reserve. Despite achieving a bridgehead on the city’s Quays, the Post Office remained in Republican hands, and machine gun fire from there prevented the Free State troops on the right bank from reaching the mechanism for the bridge and lowering it. Col.Comdt. Whelan left a rear guard in the city under the command of Capt. Jerry Cronin, so that fighting within the city continued into Friday afternoon. Although Capt. Cronin and eighteen of his men were captured with the fall of his headquarters, the Granville Hotel, pockets of Republican troops, particularly the fifteen men in Ballybricken Prison, stubbornly held out. The relative ease with which government forces rolled up the ‘Limerick-Waterford Line’ from the east, however, was not mirrored in Gen. O’Duffy’s advance southwards from the city of Limerick. The Republican forces under Comdt.Gen. Liam Deasy that had withdrawn from Limerick concentrated in the town of Kilmallock, the northern approach to which was guarded by the towns of Bruree to the west and Bruff to the east. Here more than anywhere else during the Irish Civil War the opposing sides would hold something like clearly defined front lines; each side maintaining a string of outposts in villages and towns, at crossroads, and upon hillocks, with a ‘No-Man’s Land’ varying in width between a few 100 yards to a mile. (147) Within the Kilmallock -Bruff-Bruree triangle would occur the war’s most intense two weeks of fighting. The reason for this was that the Free State troops, the majority of whom were raw recruits, were facing the best of the Republicans forces without any clear advantage in numbers or equipment. (148) Gen. O’Duffy estimated that while his forces had some 1,300 rifles, the Republicans could muster over 2,000, stating, “We are operating in large areas with nothing better than a Rifle. I estimate that the Irregulars [Republicans] have 4 Lewis Guns…for our one… As regards Rifles, the last rifle is distributed and I have none for recruits coming in.”(149) The General complained about the quality of his personnel (though doubtlessly with some exaggeration): ”We had to get work out of a disgruntled, undisciplined and cowardly crowd. Gen. O’Duffy drew up the plans for the advance on Kilmallock with the assistance of his 2nd-in-Command, Maj.Gen. W.R.E. Murphy. Maj.Gen. Murphy had served as an Acting Brigadier General in the British Army during the Great War and was now put in charge of executing operations against Kilmallock. Unfortunately for the Free State troops, his experiences in the trenches appears to have adversely shaped his approach to war. (153) On Sunday, 23 July, government forces, already in possession of the town of Bruff, began their advance on Kilmallock. Although they managed to take back the town of Bruff, Free State forces received the worst of it through the rest of the week. On Tuesday, 25 July, a unit of the Dublin Guards under Comdt. Tom Flood was ambushed in a narrow sunken road flanked by hedges. It was some time before the detachment had fought its way clear, having had three men killed and one fatally wounded. (157) Nevertheless, Maj.Gen. Murphy managed to launch a determined attack on the town of Bruree by Sunday, 30 July. Diversionary fighting was conducted all along the front to contain Republican forces in the vicinity of Bruree, while the newly recovered town of Bruff was used as the jumping off point. The main assault, directed by Maj.Gen. Murphy himself, began at 6:00 p.m., with the troops supported by a number of Whippet armored cars and an 18 pdr. field gun. While the attention of the defenders was fixed upon these forces, Comdt. Tom Flood attempted to take the town by surprise from the southeast with a detachment of Dublin Guards. The Republican defenders, however, were not fooled and stubbornly held their positions for five hours, so that artillery was needed to decide the issue. (158) Comdt.Gen. Deasy knew that Bruree was vital to the defense of Kilmallock. As such, a novel plan was hit upon for its recapture. It would involve the use of three improvised armored cars carrying assault troops armed with rifle grenades, a trench mortar, and a total of ten machine guns. Each vehicle was detailed to eliminate one of the three posts held by enemy forces in Bruree. At 2 a.m. on Wednesday, 2 August, the Republicans captured the town of Patrickswell, only ten miles south of the city of Limerick. From here the armored cars set out for Bruree, where their arrival took the sentries completely by surprise. The lead armored car attacked Comdt. Flood’s headquarters in the Railway Hotel. The Commandant and his men managed to escape out the back of the building under the cover of Lewis gun fire from a water tower. The second armored car rammed the front door of the school house, which persuaded the twenty-five troops inside to surrender. The third armored car, however, had developed engine trouble and was far behind. Word of the attack was transmitted to Comdt.Gen. Seamus Hogan, who personally led the relief forces riding in the Whippet armored car ‘The Customs House’. Having failed to secure the surrender of the town and with reinforcements approaching, the Republican troops decided to withdraw. As their armored cars sped down the road to Kilmallock, ‘The Customs House’ arrived in Bruree. To everyone’s surprise, however, the large vehicle that was followed ‘The Customs House’ turned out to be the third Republican armored car, ‘The River Lee’. Seeing that the town was still in Free State hands, ‘The River Lee’ also fled down the road to Kilmallock, with Comdt.Gen. Hogan in pursuit. It was not the overwhelming strength of the Free State forces opposing them in the Kilmallock area that had led to their withdrawal, but rather it was the arrival of government troops deep in their rear, within the ‘Munster Republic’, that forced Comdt.Gen. Deasy to abandon his defensive struggle. (163) Free State expeditionary forces had landed by sea on the coasts of Cos. Kerry and Cork, on 2 and 8 August respectively (see Appendix M). The landing in Co. Kerry had forced Comdt.Gen. Deasy to release units from this area to return home. Although the landing in Co. Cork occurred after the Republicans had withdrawn from Kilmallock, the loss of the Brigades from Cork as well only compounded Comdt.Gen. Deasy’s problems. Sea-borne landings had been the brainchild of Maj.Gen. Emmet Dalton, who pointed out the disadvantages of advancing overland into the heart of the ‘Munster Republic’, where rail lines and bridges would be destroyed and Free State columns would have to make their way through countryside that favored guerrilla tactics. (165) The strategy of relying on naval landings was not without its critics. Deputy Chief-of-Staff Comdt.Gen. Eoin O’Duffy stated in a letter to Chief-of-Staff Gen. Richard Mulcahy on 26 July, “I would consider a landing …anywhere on the Cork or Kerry coast, unwise for the present. There would be an immediate concentration of Irregulars [Republicans] and our troops would be immediately surrounded. They might make a fight, but I fear that would be all.” (166) C-in-C Michael Collins, however, adopted the idea with enthusiasm, all the more so in light of the difficulties government forces were having in the Kilmallock area. To aid in the advance in this theater, an expeditionary force was organized in Dublin. On the evening of 31 July 450 Dublin Guard, commanded by their founding officer, Brig.Gen. Paddy O’Daly, boarded the cross-channel steamer ‘Lady Wicklow’ at South Wall. A Whippet armored car and an 18 pdr. field gun were also brought on board. At 10:30 a.m. on 2 August ‘Lady Wicklow’ approached the village of Fenit, where there was a pier that extended 600 yards from the shore. The troops remained below deck until the ship was alongside the dock, when they rushed up topside and ran along the pier to the shore. Although the garrison of twenty Republicans opened fire on the invaders, machine guns on the ship, including the Vickers of the armored car, suppressed the defenders’ fire. Fenit was captured in no time and the force advanced the short distance to Tralee, where they defeated elements of the 1st Kerry Brigade and secured the city by 6:30 p.m. (167) The operation was far from bloodless, however, as nine government soldiers had been killed and thirty-five wounded. The transports left North Wall and reached Roche’s Point at 10:00 p.m. on 7 August. A pilot from Cork harbor was brought aboard the ‘Arvonia’, unaware of her mission. When he seemed reluctant to provide the necessary aid in navigating the harbor, Maj.Gen. Dalton did not hesitate to draw his side arm to help persuade him to cooperate. Initially Maj.Gen. Dalton had hoped that they could dock at Ford’s Wharf, near the city, but the pilot informed him that a ‘blockship’ had been sunk to bar the way. 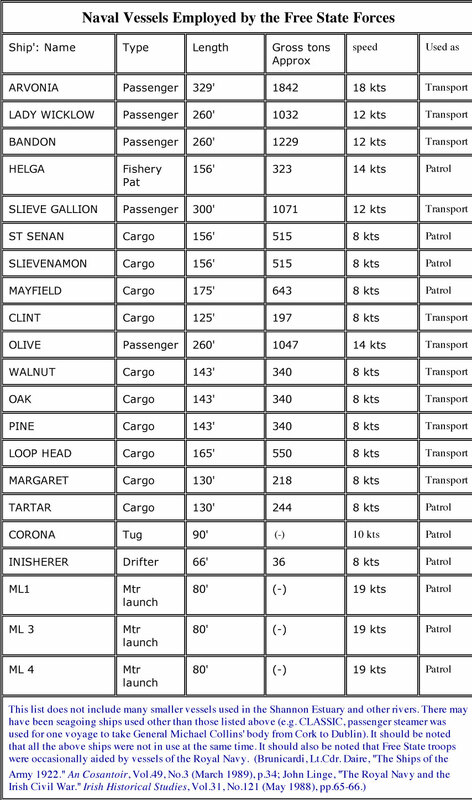 The only other deep water berth that was not mined was Passage West. Steering their vessels around another ‘blockship’, the ‘Owenacurra’, the Free State flotilla reached Passage West early Tuesday morning, 8 August. (172) At 2:00 a.m. Maj.Gen. Dalton ordered Capt. Frank O’Friel to take twenty men from his Company by boat to the shore and reconnoiter the area. Upon his return, Capt. O’Friel reported that the Republican guards had abandoned their post with the appearance of the ‘Arvonia’ and ‘Lady Wicklow’ (having captured a few of them), so that it was safe to land. Maj.Gen. Dalton waited until dawn to disembark three Companies of fifty men each, supported by an armored car and an 18 pdr., in order to form a protective screen a half a mile around Passage West. On 11 August Liam Lynch abandoned his headquarters in Fermoy and Republican forces throughout the province of Munster and beyond reverted to guerrilla warfare. The war would drag on needlessly for another eight months into the spring of 1923. Republican operations would degenerate into a campaign of sporadic sabotage. Both sides would commit atrocities that would generate bitterness that has lasted to this day. The Irish government would pass an Emergency Powers Bill allowing the execution of Republican prisoners, of which seventy-seven were killed (more than were executed by British authorities during the War of Independence). Comdt. Frank Aiken, who had succeeded Liam Lynch as Republican Chief-of-Staff after his death in 10 April, issued a cease fire and a dumping of arms on 24 April, effectively ending the war. THE SHAPE OF THINGS TO COME: A MILITARY ASSESSMENT. The Irish Civil War, like all such conflicts, was a tragedy. For military historians, however, it represents an interesting example of the conduct of warfare in the immediate aftermath of the Great War. What is remarkable about the Irish Civil War is how completely different in operational character it was from the First World War. Nothing like the trench stalemate of the Western Front developed in Ireland. Obviously, this was due to the very small number of troops engaged, the equally small number of heavy arms employed, and the reluctance of the Republicans to fight to the bitter end in conventional battles. (177) However, it is significant that virtually none of the military leaders on either side attempted to imitate trench warfare (with the notable exception, perhaps, of Maj.Gen. W.R.E. Murphy in the Kilmallock campaign). Instead, mobility was the dominant feature of the conventional phase of the Irish Civil War, particularly with regard to the Free State forces (which, admittedly, were blessed with greater resources). It is tempting to attribute this emphasis on mobility to a tradition in Irish warfare of relying on lightly armed soldiers, and the use of ‘Flying Columns’ in the War of Independence is certainly consistent with such a tradition. But it would seem that, while the majority of the military commanders on both sides participated and learned from the guerrilla war against Britain, the primary reason for an emphasis on mobility was the need for both sides to quickly establish their control over the country. Clearly the Free State forces were the winners in this race. Indeed, the Republicans only competed in a half-hearted manner. It could be argued, however, that there was another factor involved in the emphasis placed on mobility by the opposing sides; a willingness to exploit the capabilities of new technologies (or in the case of naval transport, old technologies) to their fullest. When the new technologies of armored vehicles, motorized transport, and even light, portable automatic fire arms, were introduced during the Great War, regular army officers were faced with having to incorporate them into pre-existing tactical and strategic concepts. All too often this meant that the full potential of these new technologies were not exploited. By contrast, the military commanders in the Irish Civil War, though many of them were veterans of World War I, had not been regular officers in the British, or any other Army. As such, they were less likely to have preconceived ideas about how technology should or should not be used in a war. They approached the new technologies of armored vehicles, motorized transport, light, portable automatic fire arms, and even the potential offered by the old technology of naval transport, in a fundamentally pragmatic manner. As such, they used both old and new technologies in an aggressive and imaginative fashion. While it is certainly true, for instance, that the presence of armored vehicles, as well as artillery, was often seen as a vital means of bolstering the confidence of raw recruits, the practice of assembling small motorized detachments and providing them with armored vehicles and, in the case of the Free State, artillery – essentially mobile task forces – became standard practice very early in the war. Even more significant were the examples of operations that were tailored, not around the capabilities (particularly the speed) of the foot soldier, but around the capabilities of these new technologies, such as armored vehicles. This is demonstrated by the plan suggested by Col. Patrick Paul to seize the bridge leading into the city of Waterford with a motorized column spearheaded by three or four armored cars and all the more so in the case of the actual armored assault on the town of Bruree by Republican forces. The widespread use of armored vehicles including occasions when they assumed the role of the dominant arm, the employment of mobile combined arms task forces, the exploitation of naval transport to outflank an enemy’s defensive lines on land; these were all notions that it would take regular armies a great deal of time to digest and incorporate. Many had not done so by 1939. While the more imaginative techniques that were used by the opposing forces in the Irish Civil War certainly did not serve as a model for other armed forces to emulate, it is clear that they pointed, not backwards, towards the practices of the Great War, but rather forwards towards the practices of the next World War. ,2nd Loyal North Lancashire Regt., 1st Northamptonshire Regt. SCHEDULE OF THE FINAL PHASE OF EVACUATION. Cadre 1st and 2nd Works Companies, Royal Engineers Hounslow [? To BELFAST – SS Tiger (2:30 pm) transporting Royal Army Service Corps and RAF personnel. To LIVERPOOL – Train Ferry No 2 transporting motor vehicles. Conference, Cathal Brugha Barracks, Dublin, 12 September, 1997). The Curragh (accommodations for 4,200 all ranks) – Handed over 16 May, 1922. Co. Longford – Longford town – Handed over 17 February, 1922. Co. Louth – Drogheda BarracksDundalk – Dundalk Barracks – Handed over 13 April, 1922. 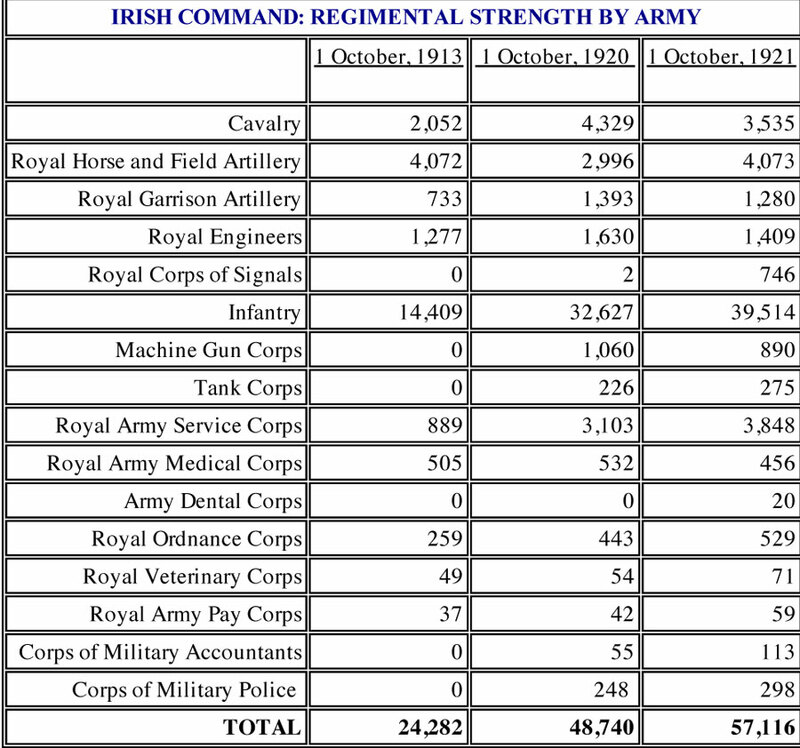 Total barracks accommodations in Ireland for 1,413 officers and 33,173 men. APPENDIX C: British Plans to Attack the Four Courts, 25 June, 1922. On 23 June the British Conference of Ministers decided on a policy of retaliation for Gen. Sir Henry Wilson’s death. They conferred with Gen. Nevil Macready, C-in-C of British Forces in Ireland, who stated that the storming of the Four Courts would, “present no great difficulty.” The only question was whether the attack should be made on Sunday, 25 or Monday, 26 June, with the former being finally settled on. A.) An aerial bombardment using aircraft dropping 120 lb. bombs. B.) An artillery bombardment using 60 pdr. and 80 pdr. guns. C.) The assault would be led by tanks, 4 Rolls Royce and 4 Peerless armored cars. D.) Destroyers were to be dispatched by Lord Beatty, First Lord of the Admiralty, to Kingstown (Dun Laoghaire) to transport prisoners back to Britain. E.) If the attack provoked a renewal of war between Ireland and Britain, reinforcements of up to 2 divisions were to be dispatched to Ireland.Gen. Macready, however, recognized that civilian casualties would be unavoidable and that the political consequences were potentially disastrous, which is why he called off the operation the day it was to take place. Macready later concluded, “Panic and a desire to do something, no matter what, by those ignorant of the Irish situation blinded them to possible results, was at the root of this scheme.” (quoted in Hopkinson, p.116). APPENDIX D: Irish Republican Army Strength, July, 1921. APPENDIX E: Sample Unit of the Irish Republican Army:Order of Battle of the 3rd Tipperary Brigade, July, 1921. The organization of the 3rd Tipperary Brigade is offered as an example of the organization of a typical I.R.A. Brigade during the Civil War period. The strength of companies were intended to be 120 men, though they were usually only a quarter of this strength. A company was intended to be composed of four sections, each section being made up of eight squads. The company’s officers – Captain, Lieutenant, and Second Lieutenant – were elected by the company using ballots. The Captain would then chose section and squad leaders on the advice of his Lieutenants. A battalion was usually formed from between five and eight companies. The officers of the companies would meet to elect the battalion’s officers: Commandant, Vice-Commandant, Adjutant, and Quartermaster. The battalion Commandant appointed the officers of the Special Services: Engineering, Signals, Communications, Transport and Supply, First Aid, and Intelligence (in fact, the battalion level Special Services officers were never chosen due to the lack of adequate training facilities). The battalion officers elected the brigade officers: Brigadier, Vice-Brigadier, Brigade Adjutant, and Brigade Quartermaster. APPENDIX F: Training Regime of the I.R.A. Location – On the grounds of Galtee, Castle, in the Galtee Mountains, Co. Tipperary. Total Length of Training Period – 5 weeks.Trainees – 70 officers from the Division’s Brigade and Battalion Staffs. All officers to be fully equipped with rifles, bayonets, small arms, grenades, and kit. The officers were divided into 8 squads.Curriculum – First two weeks devoted to training as ordinary soldiers, with an emphasis on proficiency with arms. Daily Schedule – 6:00 a.m. Bugle call for parade. Breakfast and a short rest. Cross-country run in full kit. 12:00 p.m. – Midday meal and a short rest. Lectures.Bayonet practice.Revolver and grenade training.Marksmanship using .22 calibre ammunition. One-and-a-half hours for rest or recreation. Sunset – Parade in full kit (a mixture of Irish, American, and English drill). Private study for an hour or more. 10:00 p.m. – Bugle call for lights out.For the remaining three weeks the officers were trained in administration, scouting, field-sketching, and engineering. They rehearsed assaults on barracks, springing ambushes, night maneuvers, the use of explosives and land mines, and how to maneuver various size units. (O’Malley, Ernie. The Singing Flame. (Dublin: Anvil Books, 1978), pp.19-23. Gen. Macready’s quote is from A History of the Irish Army. by John P. Duggan (Dublin: Gill and Macmillan, 1991), p.71). APPENDIX G: Order of Battle of the Irish Republican Army June, 1922.AT= Indicates units opposed to the Treaty. PT=Indicates units supporting the Treaty. General Headquarters Staff , Individual Corps Commands, and Regional Commands. 1st Western Division; 1st, 2nd, and 3rd Southern Divisions. APPENDIX I: Irish Republican Army: General Head Quarters Staff, and Regional Commands, 1922-23. APPENDIX J: Number and Distribution of Men and Arms: Free State Army, 4 August, 1922. The Rolls-Royce armored car, which the Irish nicknamed the ‘Whippet’, was built around the reliable ‘Silver Ghost’ limousine chassis, and included a revolving turret armed with a Heavy Vickers .303 water-cooled machine-gun. Although it’s engine was liable to overheat unless the armored doors protecting the radiator were left open, the Whippet had an excellent power-to-weight ratio and was relatively quiet (an important feature in counter-insurgency warfare). The term ‘Whippet’ used by the Irish to identify the Rolls-Royce should not be confused with the same nickname of ‘Whippet’ applied to the Medium Mark ‘A’ tank, of which sixteen made up the compliment of ‘B’ Company of the 17th Armoured Car Battalion in Dublin in 1919 (Anon.Short History of the Royal Tank Corps. (Wellington Works, Aldershot: Gale and Polden, Ltd., 1930), p.84; B.T. White. Tanks and Other Armored Fighting Vehicles 1900-1918. (New York: The Macmillan County, 1970), p.172; Peter Leslie, “Armoured Cars in Ireland [Pt.1]”Military Modelling (May 1980), p.398; information supplied by Prof. Denis J. McCarthy, 13 September, 1997). It was common practice to apply individual names to the Irish Army’s Rolls-Royce armored cars. Presumably ARR stood for ‘Armoured Rolls-Royce’ (it seems that there was no ARR 13 because of superstition). ARR 1 ‘Tom Keogh’ was renamed after Col.Comdt. Keogh, who was killed by a mine in August, 1922 (Duggan, p.88; O’Farrell, p.154, 167). The list does not include one of the better known Rolls-Royce Whippets that was active in the West, ‘The Ballinalee’. ‘The Ballinalee’ was employed by Free State troops until it’s capture at Rockwood on 13 July, 1922, after which it was used extensively by Republican forces under the new name ‘Lough Gill’, though most authors simply refer to it under its original name (O’Farrell, p.142). It’s absence from the list is explained by the fact that it was damaged beyond repair by an explosion, presumably detonated by the Republicans in order to deny its use to the Free State forces that had successfully cornered the armored car (information supplied by Denis J. McCarthy, 13 September, 1997). Armored vehicles other than Rolls-Royce armored cars that were used by both sides in the war also sported names, such as the Lancia ‘The Dublin Liz’ (probably a ‘Hooded Terror’ version) used by the Free State forces in Cork in August, 1922 (temporarily taking the place of ‘Slieve na mBan’ in Michael Collins’ convoy) (Younger, p.430; Meda Ryan. The Day Michael Collins was Shot. (Swords, Co. Dublin: Poolbeg Press, 1989), p58; O’Farrell, p.156). Among the Republican improvised armored cars, there was the ‘Queen of the West’ constructed in Mayo and ‘The River Lee’ constructed in Cork (O’Farrell, pp.168, 191). Some armored trains were given names (see below), and even a few artillery pieces acquired names: an 18 pdr. used by Comdt. Sean MacEoin in the West was called ‘MacEoin’s Peacemaker’, while a field gun landed at Fenit and used in Kerry was christened ‘The ‘Rose of Tralee’ (Younger, p.466; Harrington, p.122; O’Farrell, p.191). (McCarthy and English, “No.2 The Rolls-Royce Whippet”, pp.404-405; O’Malley, p.74; Morrison, p.17; Karl Martin. Irish Army Armoured Cars: An Illustrated Record. (Dublin: Karl Martin, 1983), p.5). By contrast, the Peerless was the heaviest motorized armored vehicle used in the war, with a weight of seven tons that restricted it to well paved roads. It was equipped with dual turrets armed with Hotchkiss .303 machine-guns (the dual turret arrangement was based on it’s predecessor, the Austin armored car, which, because it was originally built in Britain for Imperial Russia, had incorporated this uniquely Russian design feature). Unlike the Rolls-Royce Whippet and the Peerless, the Lancia armored personnel carrier was built in Ireland specifically for service with the RIC during the War for Independence. Around 150 were constructed in late-1920 at the Inchicore workshops of the Great Southern and Western Railway in Dublin, using two different Italian truck models, the Type IZ 1912/16 and the Triota Type 1921, and armor plates supplied by a Scottish Engineering firm. The body consisted of an armored cab for the drive, and an open top armored box in the rear for troops, with no fixed armaments. Because of the danger of grenades being thrown into the open rear compartment, many Lancias were eventually equipped with wire-netting on a frame, earning the nickname ‘Chicken Coops’ (though this expedient was overcome by the IRA’s attachment of hooks to hand grenades). One Oliver Tony in England rebuilt a Triota Type 1921 version Lancia in the early-1970s (Denis McCarthy and Peter Leslie, “[No.3: The Lancia]” An Cosantoir (May 1976), p.138; Leslie, “Armoured Cars in Ireland [Pt.2]”, p.513). In order to supplement the small number of armored cars supplied to the Irish Army by the British, a program was initiated by Maj.Gen. Furlong to convert a large number of the Lancias armored personnel carriers into armored cars equipped with their own integral fire power. A total of sixty-four Lancias were provided with armored roofs at the Inchicore workshops in Dublin (although Prof. McCarthy stated in his earlier article on the Lancia and it’s variants that the ‘Hooded Terrors’ were constructed at the Army Workshops in Gormonstown, this was based on a photo caption in the Armed Forces magazine, An t Oglach, which he now believes was incorrect (information provided by Denis J. McCarthy, 13 September, 1997). While the inclusion of revolving turrets was beyond the technical capacity of the workshops under the given time restrictions, firing ports were provided for Lewis machine-guns on the front and both sides of the vehicle. This version of the Lancia, dramatically referred to as the ‘Hooded Terror’, was crewed by a commander, gunner, and driver, though, if necessary, it could carry up to six passengers (Capt. Liam MacNamee, “The Cavalry Corps.” An Cosantoir (January 1976), p.3; McCarthy and Leslie, “[No.3: The Lancia]”, pp.136-138; Leslie, “Armoured Rail Cars”, p.8; information provided by Denis J. McCarthy, 13 September, 1997). (McCarthy and Leslie, “[No.3: The Lancia]”, pp.136-138; Leslie, “Armoured Cars in Ireland [Pt.1]”, p.400; Martin, p.3). one boxcar and two flatcars. one partially armored boxcar and two flatcars. No.7 Dublin One armored locomotive and two fully armored cars. an additional separate armored locomotive. APPENDIX L: Aircraft Employed by the Free State Air Corps. Anon. Short History of the Royal Tank Corps. (Wellington Works, Aldershot: Gale and Polden, Ltd., 1930). Balfour, G. The Armoured Train: It’s Development and Usage. (London: B.T. Batsford Ltd., 1981). Bates, Capt. Martin D. “The Barracks and Posts of Ireland, Part 1: The Barrack Book – 1904.”An Cosantoir, Vol.25, No.1 (January, 1965), pp.19-24. Breen, Dan. My Fight for Irish Freedom. Revised Edition (Dublin: Anvil Books, 1978). Brunicardi, Lt.Cdr. Daire, “The Ships of the Army 1922.” An Cosantoir, Vol.49, No.3 (March 1989), pp.31-35. Davis, Troy, “The Irish Civil War and the ‘International Proposition’ of 1922-23.” Eire-Ireland, Vol.29, No.2 (1994), pp.92-112. Duggan, John P. A History of the Irish Army. (Dublin: Gill and Macmillan, 1991). Fennelly, Teddy. Fitz [Col. James C. Fitzmaurice] and the Famous Flight. (Portlaoise, Co. Laois: Arderin Publishing Co. in conjunction with The Leinster Express, 1997). Fletcher, David. War Cars: British Armoured Cars in the First World War. (London: Her Majesty’s Stationary Office, 1987). Gavin, Joseph and Harold O’Sullivan. Dundalk: A Military History. (Dundalk: Dundalgan Press, 1987). Garvin, Joseph, “The Aftermath of the Civil War.” unpublished paper, “The Civil War” Conference, Cathal Brugha Barracks, Dublin, 13 September, 1997. Harrington, Niall C. Kerry Landing, August 1922: An Episode of the Civil War. (Dublin: Anvil Books, 1992). Harvey, Dan and Gerry White. The Barracks: A History of Victoria/Collins Barracks, Cork. (Cork: Mercier Press, 1997). Hopkinson, Michael. Green Against Green: The Irish Civil War. (Dublin: Gill and Macmillan, 1988). Kinsella, A. “The British Withdrawal.” unpublished paper, “The Civil War” Conference, Cathal Brugha Barracks, Dublin, 11 September, 1997. Leonard, Jane. “World War I Veterans within the National Army’s Officer Corps.” unpublished paper, “The Civil War” Conference, Cathal Brugha Barracks, Dublin, 11 September, 1997. Leslie, Peter, “Armoured Rail Cars in Ireland.”, Military Modelling Annual (1974), pp.6-9. —–. “Armoured Cars in Ireland.”, Military Modelling (May 1980), pp.398-400; (June 1980), p.513. Linge, John, “The Royal Navy and the Irish Civil War.” Irish Historical Studies, Vol.31, Issue No.121 (May 1998), pp.60-71. MacCarron, Donal. Wings Over Ireland: The Story of the Irish Air Corps. (Earl Shilton, Leicester: Midland Publishing Ltd., 1996). MacGinty, Tom. The Irish Navy: A Story of Courage and Tenacity. (Tralee, Co. Kerry: The Kerryman Ltd., 1995). MacNamee, Capt. Liam, “The Cavalry Corps.”, An Cosantoir, Vol.36, No.1 (January 1976),pp.3-11. Martin, F.X. (Ed.). The Irish Volunteers 1913-1915: Recollections and Documents. (Dublin: James Duffy & Co., 1963). Martin, Karl. Irish Army Armoured Cars: An Illustrated Record. (Dublin: Karl Martin, 1983). Malmassari, Paul. Les Trains Blindes 1826-1989. (Editions Heimdal, 1989). McCarthy, Denis and Adrian J. English, “Armoured Fighting Vehicles of the Army: No.1 The Peerless Armoured Car.”, An Cosantoir (August 1975), pp.280-281. ——. “Armoured Fighting Vehicles of the Army: No.2: The Rolls-Royce Whippet Armoured Car.”, An Cosantoir (December 1975), pp.404-405. McCarthy, Denis and Peter Leslie, “Armoured Fighting Vehicles of the Army [No.3: The Lancia Armoured Personnel Carrier].”, An Cosantoir (May 1976), pp.136-138. McIvor, Aidan. A History of the Irish Naval Service. (Dublin: Irish Academic Press, 1994). Mitchell, Arthur. Revolutionary Government in Ireland: Dail Eireann 1919-22. (Dublin: Gill & Macmillan, 1995). Morrison, George. The Irish Civil War: An Illustrated History. (Dublin: Gill and Macmillan, 1981). Neeson, Eoin. The Civil War 1922-23. Revised Edition (Swords, County Dublin: Poolbeg Press Ltd., 1989). Nowlan, Kevin B. “Dail Eireann and the Army: Unity and Divisions (1919-1921).” pp.67-77. in The Irish Struggle v1916-1926. edited by Desmond Williams (London: Routledge & Kegan Paul, 1966). O’Donoghue, Florence. No Other Law: The Story of Liam Lynch and the Irish Republican Army, 1916-1923. (Dublin: Irish Press Ltd., 1954). O’Farrell, Padriac. Who’s Who in the Irish War of Independence and Civil War 1916-1923. (Dublin: The Lilliput Press, 1997). O’Flanagain, Peadar, “Brigadier-General Joe Ring: ‘A Brave Soldier Who’s Courage was never in Doubt’.” Journal of the Westport Historical Society, Vol.7, No.1 (1987), pp.5-20. O’Halpin, Eunan, “The Army in Independent Ireland”, pp.407-430. in A Military History of Ireland. edited by Thomas Bartlett and Keith Jeffery (Cambridge: Cambridge University Press, 1996). O’Malley, Ernie. The Singing Flame. (Dublin: Anvil Books, 1978). O’Reilly, Terence, “The Battle of Waterford, 1922”, Decies, No.26 (Summer 1984), pp.31-37. Ryan, Meda. The Day Michael Collins was Shot. (Swords, County Dublin: Poolbeg Press, 1989). Seaman, Mark, “A Watching Brief? The British Army and the Civil War”, unpublished paper, “The Civil War” Conference, Cathal Brugha Barracks, Dublin, 12 September, 1997. Shelley, John R. A Short History of the 3rd Tipperary Brigade. (John R. Shelley: 1996). Valiulis, Maryann Michele Gialanella, “The Irish Army Mutiny of 1924.” Doctoral Dissertation, Loyola University of Chicago, Chicago, 1977 [published as Almost a Rebellion: The Irish Army Mutiny of 1924. (Cork: Tower Books, 1985)]. White, B.T.. Tanks and Other Armored Fighting Vehicles 1900-1918. (New York: The Macmillan County, 1970). Younger, Carlton. Ireland’s Civil War. (Glasgow: Fontana, 1970). ADDITIONAL PUBLISHED SOURCES FOR THE IRISH CIVIL WAR THATWERE NOT CONSULTED FOR THIS PAPER. (These items were not consulted either because they had nothing to add to the military history of the conventional phase of the war, because the author only came across them after completing this paper, or because they were published since the completion of this paper). Bergin, Lt.Col. W.J. “Ambush on the Grey Ghost” An Cosantoir, (May 1978), pp.135-136. Blake, Frances M. The Irish Civil War and what It still means for the Irish People. (London: Information on Ireland, 1986). Coogan, Tim Pat, and George Morrison. The Irish Civil War. (London: Weidenfeld and Nicholson, n.d. ). Curran, Joseph M. The Birth of the Irish Free State 1921-1923. (Alabama: University of Alabama Press, 1980). Deasy, Liam. Brother Against Brother. (Cork: Mercier Press, 1973; 1998). Delemere, W.P. “Early Days in the Army Air Service.” An Cosantoir, (September 1972), pp.168-170. Duggan, John P. “Use of Artillery in the Civil War (1922-23).”, An Cosantoir(November-December 1988), pp.36-37. Hart, Peter. “The Geography of Revolution in Ireland 1917-1923.” Past & Present., No.155 (May 1997), pp.142-155. Hayes, Michael, “Dail Eireann and the Irish Civil War.” Studies, (Spring 1969), pp.1-23. Litton, Helen. The Irish Civil War: An Illustrated History. (Dublin: Wolfhound Press Ltd., 1995). Macardle, Dorothy. Tragedies of Kerry. (Dublin: Irish Freedom Press, 1924; 1998). ——. The Irish Republic: A Documented Chronicle of the Anglo-Irish Conflict and the Partition of Ireland, with a Detailed Account of the Period 1916-1923. (New York: Farrar, Straus and Giroux, 1937). Murphy, Jeremiah. When Youth was Mine: A Memoir of Kerry 1902-1925. (Dublin: Mentor Press, 1998). O’Bradaigh, Ruiri. Dalseacht: The Story of Comdt. General Tom Maguire and the Second (All-Ireland) Dail. (Dublin: Irish Freedom Press, 1997). O’Gadhra, Nollaig. Civil War in Connacht 1922-1923. (Dublin: Mercier Press, 1999). Pinkman, John A. In the Legion of the Vangaurd. (Cork: Mercier Press, 1998). Valiulis, Maryann Michele Gialanella. Portrait of a Revolutionary: General Richard Mulcahy and the Founding of the Irish Free State. (Dublin: Irish Academic Press, 1992). “Proceedings at the Opening Session of a Conference on The Civil War 1922-1923.” pp.273-274. “The British Military Evacuation.” by Anthony Kinsella, pp.275-286. “The Civil War from a Pro-Treaty Perspective.” by Michael Hopkinson, pp.287-292. “The Irish Civil War 1922-1923: an Anti-Treaty Perspective.” by Brian P. Murphy, pp.293-307. “Organisation and Development of the Pro-Treaty Forces, 1922-1924.” by Patrick Long, pp.308-330. “The Special Infantry Corps.” by Anthony Kinsella, pp.332-345. “The Pettigo – Belleek Triangle Incident.” by Anthony Kinsella, pp.347-366. “External Intelligence and the Civil War.” by Eunan O’Halpin, pp.367-378. “Women and the Civil War.” by Ann Matthews, pp.379-386. “The Aftermath of the Civil War.” by Tom Garvin, pp.387-395. 1 Joseph Garvin, “The Aftermath of the Civil War.” unpublished paper, “The Civil War” Conference, Cathal Brugha Barracks, Dublin, 13 September, 1997. Alternate Figures include 4,000 and 5,000, but all figures are speculative, as there is no clear record of Republican or civilian casualties. Gen. Richard Mulcahy stated that the Free State Army suffered 540 deaths, while the government placed the figure at 800 between July, 1922 and April, 1924 (Michael Hopkinson. Green Against Green: The Irish Civil War. (Dublin: Gill and Macmillan, 1988). 2Eoin Neeson. The Civil War 1922-23. Revised Edition (Swords, Co. Dublin: Poolbeg Press Ltd., 1989), pp.13-14; Garvin. 3For general histories of the Irish Defence Forces, see: Austin Pender (ed.). The Irish Defence Forces: A Handbook. (Dublin: An Cosantoir, 1988); John P. Duggan. A History of the Irish Army. (Dublin: Gill and Macmillan, 1991); Eunan O’Halpin, “The Army in Independent Ireland.”, pp.407-430. in A Military History of Ireland. edited by Thomas Bartlett and Keith Jeffrey (Cambridge: Cambridge University Press, 1996). For participation in U.N. Peacekeeping operations, see: Norman MacQueen, “Ireland and the United Nations Peacekeeping Force in Cyprus.” Review of International Studies, Vol.9 (1983), pp.95-108; Norman MacQueen, “National Politics and the Peacekeeping Role: Ireland and the United Nations Operations in the Congo.” War & Society, Vol.6, No.1 (May, 1988), pp.93-112; Henry McDonald. Irishbatt: The Story of Ireland’s Blue Berets in the Lebanon. (Dublin: Gill and Macmillan, 1993); Special Issue of An Cosantoir: The Defence Forces Magazine, Vol.55, No.7 (October, 1995); Special Issue of The Irish Sword: The Journal of the Military History Society of Ireland, “The Irish Defence Forces and the United Nations” Vol.20, Issue No.79 (Summer, 1996). 4. 4J. Bowyer Bell. The Secret Army: The IRA 1916-1970. (New York: The John Day Co., 1971); Tim Pat Coogan. The IRA: A History. Revised Edition (Niwot, Col.: Roberts Rinehart Publishers, 1993). 5. 5For the Irish War of Independence, see: Dan Breen. My Fight for Irish Freedom (Dublin: The Talbot Press, 1944); Demond Ryan. Sean Treacy and the 3rd Tipperary Brigade (Tralee, Co. Kerry: The Kerryman, 1945); Tom Barry. Guerrilla Days in Ireland (Dublin: Irish Press, 1949); Florence O’Donoghue. No Other Law: The Story of Liam Lynch and the IRA, 1916-1923 (Dublin: Irish Press, 1954); Richard Bennett. The Black and Tans(New York: Barnes and Noble, 1959; 1995); Edgar Holt. Protest in Arms (London: Putnam and Co., 1960); Michael O’Suilleabhain. Where Mountainy Men have Sown: War and Peace in Rebel Cork in the Turbulent Years 1916-1921 (Cork: Anvil, 1965); G.A. Hayes-McCoy, “The Conduct of the Anglo-Irish War (January 1919 to the Truce in July 1921)”, pp.55-66. in The Irish Struggle 1916-1926. edited by Desmond Williams (London: Routledge and Kegan Paul, 1966); Ewan Butler. Barry’s Flying Column: The Story of the IRA’s Cork No.3 Brigade 1919-21 (London: Leo Cooper, 1971); Charles Townshend. The British Campaign in Ireland 1919-1921: The Development of Political and Military Policies. Oxford Historical Monographs (Oxford: Oxford University Press, 1975); Charles Townshend, “The Irish Republican Army and the Development of Guerrilla Warfare 1916-1921”, English Historical Review, Vol.94 (1979), pp.318-345; Michael Brennan. The War in Clare (Dublin: Irish Academic Press, 1980); Eunan O’Halpin, “British Intelligence in Ireland, 1914-1921”, pp.54-77. in The Missing Dimension: Government and Intelligence Communities in the Twentieth Century. edited by C. Andrew and D. Dilks (London: Macmillan, 1984); Ulick O’Connor. The Troubles: The Struggle for Irish Freedom 1912-1922. Revised edition (London: Mandarin, 1989); David FitzPatrick (Ed.)Revolution? Ireland 1917-1923 (Dublin: Trinity History Workshop, 1990); Michael Farry. Sligo 1914-1921: A Chronicle of Conflict (Trim, Co. Meath: Killoran, 1992). 6. 6Hopkinson, pp.6, 38; Arthur Mitchell. Revolutionary Government in Ireland: Dail Eireann 1919-22. (Dublin: Gill and Macmillan, 1995), pp.65-66. 7. 7O’Halpin, “The Army…” p.407. 8. 8Kevin B. Nowlan, “Dail Eireann and the Army: Unity and Divisions (1919-1921).” pp.67-77. in The Irish Struggle 1916-1926. edited by Desmond Williams (London: Routledge & Kegan Paul, 1966), p.73; Maryann Michele Gialanella Valiulis, “The Irish Army Mutiny of 1924.” Doctoral Dissertation, Loyola University of Chicago, Chicago, 1977, p.38; Hopkinson, p.6. 9. 9Quoted in Hopkinson, p.7. 10. 10Quoted in Hopkinson, p.8. 11. 11Valiulis, pp.33-37; Hopkinson, p.11; Mitchell, pp.78-79. 12. 12Both quoted in Hopkinson, pp.11, 12. 13. 13Quoted in Hopkinson, p.9. Also Duggan, p.67. 15. 15Ernie O’Malley. The Singing Flame. (Dublin: Anvil Books, 1978), pp.15, 25, 46; Hopkinson, p.16. 16. 16Duggan, p.71; Hopkinson, p.19. 17. 17For the best account of the negotiations, see: Frank Pakenham. Peace by Ordeal: An Account, from First-Hand Sources, of the Negotiation and Signiture of the Anglo-Irish Treaty 1921. (London: Jonathan Cape, 1935; 1992). 18. 18O’Malley, p.41; Duggan, p.72. 19. 19Quoted in Hopkinson, p.36. 20. 20For the attitudes of opponents of the Treaty, particularly within the I.R.A., see: O’Malley, pp.41-42, 43-46; Valiulis, pp.73-74; Duggan, p.76; Hopkinson, pp.37-40. 21. 21Quoted in Hopkinson, p.37. 22. 22O’Malley, p.47; Duggan, p.73; Hopkinson, p.39. 23. 23Valiulis, pp.64-65; Duggan, p.73; Hopkinson, p.84; Niall C. Harrington. Kerry Landing, August 1922: An Episode of the Civil War. (Dublin: Anvil Books, 1992), pp.8-9; O’Halpin, p.408. 24. 24Eoin Neeson. The Civil War in Ireland 1921-23. Revized Edition (Swords, Co. Dublin: Poolbeg Press, Ltd., 1989), p.126; Hopkinson, p.70; Troy Davis, “The Irish Civil War and the ‘International Proposition’ of 1922-23.” Eire-Ireland, Vol.29, No.2 (1994), p.97. 25. 25Quoted in both Hopkinson, p.41 and Mitchell, p.75. 26. 26Quoted in Hopkinson, p.67. Harrington, p.13. 28. 28The formation of the predecessor of the I.R.A., the Irish Volunteers, before the creation of a civilian government was reflected in the Irish Volunteers’ constitution of 1914, “To train, discipline and equip for this purpose [To secure and maintain the rights and liberties common to all the people of Ireland] an Irish Volunteer Force which will render service to an Irish National Government when such is established.” (my italics) (F.X. Martin (ed.). The Irish Volunteers 1913-1915: Recollections and Documents. (Dublin: James Duffy & Co., 1963), p.159. 29. 29Florence O’Donoghue. No Other Law: The Story of Liam Lynch and the irish Republican Army, 1916-1923. (Dublin: Irish Press Ltd., 1954), p.225; O’Malley, pp.54, 67; Valiulis, pp.90, 93-94; Duggan, p.74; Hopkinson, p.67; Harrington, p.21. The anti-Treaty I.R.A. turned to bank robbery for their finances. On the first two days in May twenty-six banks were raided, with 156,392 pounds sterling taken (Duggan, p.79). 30. 30Hopkinson, p.69. Also Harrington, pp.10-11. 31. 31O’Malley, p.48; Hopkinson, pp.52-54. 32. 32Dan Breen. My Fight for Irish Freedom. Revised Edition (Dublin: Anvil Books, 1978), p.166; O’Malley, p.68; Duggan, p.78; Hopkinson, p.72; Harrington, pp.18-19. 33. 33Serious confrontations over the occupation of evacuated barracks occured in Limerick city and, of lesser importance, at Templemore, Birr, and Renmore. Fighting actually broke out in Kilkenny, though an agreement was reached that resolved the crisis. O’Donoghue, pp.205-207; Breen, p.164; O’Malley, pp.54-61, 76; Duggan, pp.77-78; Hopkinson, pp.63-66, 75; Harrington, pp.11-13. 34. 34O’Donoghue, p.240; Breen, pp.167-168; O’Malley, pp.78-79; Hopkinson, pp.97-108; Harrington, pp.23-25, 26. 35. 35Out of 620,283 votes cast, 239,193 went to Sinn Fein candidates who supported the Treaty, 133,864 went to Sinn Fein candidates who opposed the Treaty, and 247,276 votes went to non-Sinn Fein candidates (Hopkinson, pp.110-111). 36. 36O’Donoghue, p.255; O’Malley, pp.84-85; Duggan, pp.79-80; Hopkinson, pp.112-114; Harrington, p.29. For the issue of Michael Collin’s involvement, see: Peter Hart, “Michael Collins and the Assassination of Sir Henry Wilson.” Irish Historical Studies, Vol.28, No.110 (November, 1992), pp.150-170. 39. 39O’Donoghue, p.256; Hopkinson, p.115; Harrington, pp.27-28. The split had, in fact, occured over Ernie O’Malley’s proposal that the I.R.A. attack the remaining British forces in Dublin. Although it passed on the first vote, it was narrowly defeated in the second (O’Malley, p.80-81, 83). 40. 40O’Donohue, p.256; O’Malley, pp.88-90; Duggan, p.80; Hopkinson, pp.117-118; Harrington, pp.28-29. 41. 41O’Malley, pp.73-74; Duggan, p.82; Harrington, p.45; Padraic O’Farrell. Who’s Who in the Irish War of Independence and the Civil War. (Dublin: Lilliput Press, 1997), p.143. 43. 43O’Donoghue, pp.214, 219; Breen, p.166; O’Malley, pp.49-51; Neeson, pp.325-327; Harrington, pp.14, 34. 44. 44O’Donoghue, p.214; Hopkinson, p.58. 45. 45O’Donoghue, p.261; Neeson, pp.125, 140, 150-152; Valiulis, p.107; Hopkinson, p.128; Harrington, pp.33, 34, 40; Davis, pp.94-95. 46. 46O’Malley, p.75. Also quoted in Hopkinson, p.73. 47. 47O’Donoghue, pp260-261. Also quoted in Hopkinson, p.119. 48. 48Quoted in Hopkinson, pp.127-128. O’Donoghue, p.266; Neeson, p.151. 49. 49O’Donoghue, p.266; Breen, pp.175, 178; Hopkinson, p.128. 51. 51Hopkinson, p.16. An alternate term that was used was ‘Trucers’ (O’Malley, pp.36-37; Harrington, p.5). 52. 52Harrington, pp.8, 64. Their full title was ‘Dublin City Guard’ (Duggan, p.75; Hopkinson, pp.61, 117). 54. 54Harrington, pp.36, 68; Jane Leonard, “World War I Veterans within the National Army’s Officer Corps” unpublished paper, “The Civil War” Conference, Cathal Brugha Barracks, Dublin, 11 September, 1997. Neeson states that following the national call to arms, the Free State Army recruited nearly 1,000 men a day, resulting in a force of 60,000 at the conclusion of the war (Neeson, p.145). 55. 55O’Donoghue, p.261; Younger, p.381; Hopkinson, pp.61-62, 136; Neeson, pp.131, 153; Harrington, pp.37-38; Tom MacGinty. The Irish Navy: A Story of Courage and Tenacity. (Tralee, Co. Kerry: The Kerryman Ltd., 1995), p.89; Leonard. 56. 56Leonard. When an officer in the Air Corps was found to have served with the equally infamous ‘Auxiliaries’, he was immediately removed (Donal MacCarron. Wings Over Ireland: The Story of the Irish Air Corps. Earl Shilton, Leicester: Midland Publishing Ltd., 1996), p.15; Teddy Fennelly. Fitz [Col. James C. Fitzmaurice] and the Famous Flight. (Portlaoise, Co. Laois: Arderin Publishing Co., 1997), p.99). 57. 57Quoted in Hopkinson, p.137. 58. 58Quoted in Hopkinson, p.61. 59. 59Carlton Younger. Ireland’s Civil War. (New York: Taplinger Pub., 1968), pp.394, 455; O’Malley, p.86; Harrington, p.8. 60. 60Younger, p.370. This was reflected in the graffiti that adorned numerous barracks walls, ‘Collins stood by us: we’ll stand by him’ (quoted in Duggan, p.77). 61. 61O’Donoghue, p.226; Neeson, p.131; Leonard. 62. 62Younger, p313; Hopkinson, p.117. 64. 64Quoted in Hopkinson, p.62. 65. 65Younger, pp.349, 385; Hopkinson, p.131; Duggan, p.87. At the Battle for Blessignton, where the Goodwin brothers, Rob and John, found themselves fighting on the opposite side, one of them remarked that although there was, “more ammunition fired there than at the Somme no one was hurt.” (Quoted in Duggan, p.87). 66. 66O’Donoghue, pp.226, 261; Hopkinson, p.127. 67. 67O’Donoghue, pp.225-226; O’Malley, p.71; Duggan, p.76; Hopkinson, p.131; Neeson, pp.56, 96; Harrington, pp.10, 16-17, 35; MacGinty, pp.91, 92; Davis, p.96; John Linge, “The Royal Navy and the Irish Civil War.” Irish Historical Studies, Vol.31, No.121 (May 1998), pp.61, 64, 68-70. 68. 68Quoted in Hopkinson, pp.136-137. 70. 70Duggan, p.109. Duggan states that the total number of guns included five MK.I 18 pdr. field guns and four Mk.II 18 pdr. field guns. 71. 71Younger, p.316; Duggan, p.83. 72. 72Neeson, p.138; Younger, p.382; Davis, p.96. 73. 73Joseph Gavin and Harold O’Sullivan. Dundalk: A Military History. (Dundalk: Dundalgan Press, 1987), p125; Davis, p.96. 74. 74Hopkinson, pp.236-237; Davis, pp.98, 100, 106. 78. 78O’Malley, pp.71, 112, 110, 92, 98; Neeson, p.118; Duggan, p.82. Younger quotes 200 men for the garrison, while, in a speech, Prime Minister Lloyd George referred to between 300 and 400 Republicans in the Four Courts (Younger, p.317; O’Malley, p.90). 79. 79O’Malley, p.72; Hopkinson, p.121. 80. 80O’Malley, p.91; Hopkinson, p.119. 82. 82Younger, pp.312-313; George Morrison. The Irish Civil War: An Illustrated History. (Dublin: Gill and Macmillan, 1981), p.37; Hopkinson, p.117; Neeson, p.119; Seaman. Neeson offered the estimates for Free State forces of between 7,000 and 14,000, but these figures may simply be speculation (Neeson, p.119). Col. Tony Lawlor, who served as a pilot in the Great War, had been training a number of his men at Athlone in using an old horse drawn 15 pdr. that had been left there by the British garrison (Younger, p.312; Morrison, p.37). O’Donoghue asserts that the guns were operated by British gunners, for which there is no evidence (O’Donoghue, pp.256-257). 83. 83Younger, p.314; O’Malley, p.93; Morrison, p.42. 84. 84Quoted in Younger, p.312. 85. 85Younger, pp.314-315; O’Malley, p.98; Morrison, p.37; Hopkins, p.117. 87. 87Neeson, P.132, ftn.2; Seaman. Quote from Hopkinson, p.120. Other sources state that it was ten shells per gun and that even the initial supply had been shrapnel (Younger, p.313; Morrison, p.37). 90. 90O’Malley, p.71; Morrison, p.46. 91. 91Younger, pp.318-319; O’Malley, pp.106-108, 123; Morrison, p.41. 92. 92Younger, p.319; O’Malley, pp.108-113; Morrison, p.38; Hopkinson, pp.121-122. 94. 94Younger, pp.318, 320-321; O’Malley, pp.114-115; Hopkinson, p.122; Neeson, p.121. Neeson claims that fifty Free State soldiers were injured and many killed. Churchill’s quote from Younger, p.324, and Duggan, p.83, ftn.70. 95. 95Younger, pp.321-322; O’Malley, pp.115-122; Neeson, p.123; Duggan, p.83. O’Donoghue states that two of the Four Courts garrison were killed (O’Donoghue, p.257). 96. 96Younger, pp.324-325; Morrison, pp.48-49; Hopkinson, pp.121, 123-124; Duggan, p.83. 97. 97Younger, p.325; Morrison, p.48; Hopkinson, p.121; Neeson, p.124; Duggan, p.83. 98. 98Younger, pp.325, 326; Neeson, p.124. 99. 99Younger, p.329; Morrison, p.55; Neeson, p.127; Duggan, p.83. 100. 100Younger, p.330; Hopkinson, p.124. The tenacity of the Republicans, however, was such that the Irish government appealed to the British for chemical weapons, stating, “if they [the Free State Army] could be supplied with some form of gas grenades their task in clearing the rebels out of their strongholds would be greatly simplified.” On Tuesday, 4 July the British Cabinet decided that, while supplying poison gas munitions would be ‘improper’, tear gas could be provided. Presumably the fighting in Dublin concluded before arrangements could be made to provide the Free State forces with tear gas and the matter was dropped, as there is no evidence for the use of chemical weapons during the war (quoted in Younger, p.331). 101. 101Younger, pp.329-330; Neeson, p.128; Duggan, p.83. 102. 102O’Donoghue, p.257; Younger, p.330; Morrison, pp.56, 61, 63; Neeson, pp.128-129; Duggan, p.83. 103. 103O’Donoghue, p.257; Younger, pp.332-333; Morrison, p.65; Hopkinson, p.124; Neeson, pp.130-131; Duggan, p.83. 104. 104O’Donoghue, p.257; Younger, pp.335-336; Duggan, pp.85-86; Hopkinson, pp.142-143; Neeson, pp.133-135. 106. 106Younger, p.336; Duggan, pp.86-87; Hopkinson, p.143; Neeson, pp.135-137. 107. 107For the most detailed account of the events in Co. Louth during the Civil War, see: Joseph Gavin and Harol O’Sullivan. Dundalk: A Military History. (Dundalk: Dundalgan Press Ltd., 1987), pp.109-137. 108. 108Breen, p.166; O’Malley, p.132. 109. 109O’Donoghue, p.258; O’Malley, p.133. 110. 110O’Donoghue, pp.261, 265; Younger, pp.362, 370; Duggan, p.87; Hopkinson, p.129; Neeson, p.140; Harrington, p.39. 111. 111Quoted in Younger, p.362. 112. 112Younger, p.362, 363-364; Hopkinson, pp.146. 113. 113O’Donoghue, pp.261-262; Younger, pp.362-363; Hopkinson, pp.146-148; Neeson, p.140. 114. 114Younger, pp.362-363; Hopkinson, p.147. 115. 115Younger, p.363; Hopkinson, p.148. John B. Magruder was the Confederate General who managed to fool the Union Gen. George B. McClellan into thinking his forces were far larger than they actually were during the Penninsula Campaign, April-May, 1862 (James B. McPherson. Battle Cry of Freedom: The Civil War Era. The Oxford History of the United States Series (New York: Oxford University Press, 1988) p.426). 116. 116O’Donoghue, p.262; Younger, p.364; Hopkinson, p.147; Neeson, p.140. 118. 118Quoted in Hopkinson, p.147. 119. 119O’Donoghue, pp.263-265; Younger, p.365; Duggan, p.87. 120. 120Quoted in Hopkinson, p.149. Hopkinson, pp.148-149. 121. 121Younger, p.368; Hopkinson, p.149. 122. 122Quoted in Hopkinson, p.149. Younger, p.369; Neeson, p.146. 123. 123Quoted in Younger, p.146. 126. 126Younger, pp.362-363; Duggan, p.87; Hopkinson, pp.146-148; Neeson, pp.140, 147. 127. 127Younger, p.370; Duggan, p.87; Neeson, p.145. 128. 128Younger, p.371; Neeson, pp.145, 147. 129. 129Younger, p.372; Hopkinson, p.149. 130. 130Younger, pp.372-373; Duggan, p.87 Hopkinson, pp.149-150; Neeson, p.148. 131. 131Younger, p.373; Hopkinson, p.150; Neeson, pp.148-149. 132. 132Hopkinson, p.158; Neeson, p.152. 133. 133Younger, p.382; Terence O’Reilly, “The Battle of Waterford.” Decies, No.26 (Summer, 1984), p.31; Duggan, pp.88, 91; Hopkinson, pp.154, 155; Neeson, pp.151, 152, 155. The Republicans occupied the Infantry Barracks, the Artillery Barracks, Ballybricken Prison, the Post Office, the Country Club, Reginald’s Tower, the offices of the Munster Express, Farrell’s Corn Store, J. and S. Phelan’s Stores, Hall’s Store, Hearne & Co., and the Adelphi, Granville, Breen and Imperial Hotels. 134. 134Younger, p.381; Duggan, p.89; Hopkinson, p.154. Hopkinson also states that Collins dispatched 500 rifles and several machine guns to Maj.Gen. Prout, though he may be confusing this with the 500 rifles delivered to Waterford after its capture. 135. 135Younger, p.382; Neeson, p.154. 136. 136Younger, p.382; O’Reilly, pp.32-34; Duggan, p.89; Hopkinson, p.154; Neeson, pp.154-155. Hopkinson refers to the high ground overlooking the city of Waterford from the left bank as Mount Mercy. 137. 137Quoted in Younger, p.155. 138. 138O’Reilly, p.381; Duggan, p.89; Neeson, p.153. 139. 139Younger, pp.382-383; O’Reilly, pp.32-34; Duggan, p.89; Neeson, p.155. 140. 140Younger, p.383; O’Reilly, p.35; Duggan, p.90; Neeson, pp.155-156. 141. 141Younger, p.385; O’Reilly, pp.32-34; Duggan, pp.89-90; Hopkinson, p.155; Neeson, pp.156-157. 142. 142Younger, pp.383-384; O’Reilly, p.35; Neeson, p.158. 144. 144Younger, p.385; O’Reilly, pp.35-36; Neeson, p.159. 145. 145Younger, p.386; Hopkinson, p.155. Younger states that nine men were killed; presumably these figures include the casualties on both sides and the civilian dead. 146. 146Younger, pp.386-393; Neeson, pp.161-177. 149. 149Quoted in Hopkinson, p.151. 150. 150Quoted in Hopkinson, p.152. 151. 151Quoted in Hopkinson, p.152. 153. 153Younger, p.393; Duggan, pp.88, 333 ftn.75. 154. 154Younger, p.393; Neeson, p.201. 155. 155The 1st Cork Brigade’s armoured car was probably ‘The River Lee’; an enormous coal lorry that had been fitted with armoured plates in Cork city and was armed with two Lewis machine-guns. One officer in the 1st Cork Brigade, Jamie Managhan, remarked on both it’s size and it’s presence throughout the Kilmallock area, “[It] cruised around like a labourers cottage” (Young, p.417; Hopkinson, p.151; Neeson, p.227; O’Farrell, p.191). 156. 156Younger, pp.393-394; Hopkinson, pp.151, 152; Neeson, pp.202-203. 158. 158Younger, p.394; Duggan, p.88; Hopkinson, p.152; Neeson, pp.204-205. 159. 159Younger, p.404; Neeson, pp.205-207. 160. 160Quoted in Hopkinson, p.152. 161. 161Duggan, p.88; Neeson, p.208. 162. 162Younger, pp.395-396; Duggan, p.88; Hopkinson, p.152; Neeson, pp.208-209. 164. 164Peadar O’Flanagain, “Brigadier-General Joe Ring: ‘A Brave Soldier Who’s Courage was never in Doubt’.” Journal of the Westport Historical Society, Vol.7, No.1 (1987), pp.14-17; Harrington, p.41; Aidan MacIvor. A History of the Irish Naval Service. (Dublin: Irish Academic Press, 1994), pp.43-44. MacGinty mistakenly identifies the vessel used in the Westport landing as the ‘Tartar’, while Harrington states it was the ‘Arvonia’ (Harrington, p.41; MacGinty, p.94). 165. 165Lt.Cdr. Daire Brunicardi, “The Ships of the Army 1922.” An Cosantoir, Vol.49, No.3 (March 1989), p.32; Harrington, pp.40-41; McIvor, pp.43, 44, 46; MacGinty, p.95. Harvey and White mistakenly attribute the idea for naval landings to Michael Collins (Dan Harvey and Gerry White. The Barracks: A History of Victoria/Collins Barracks, Cork. (Cork: Mercier Press, 1997), p.103). 166. 166Quoted in Harrington, p.42. 167. 167Neeson, pp.210-212; Harrington, pp.69-80, 91-103; McIvor, p.44. 169. 169Neeson, p.214; McIvor, p.46. 170. 170Younger, p.399; McIvor, p.42. 171. 171Younger, pp.399-400; Brunicardi, p.33; MacGinty, pp.95-96; Neeson, p.224; Harvey and White, p.104. 172. 172Younger, p.401; Brunicardi, p.33; McIvor, p.48; MacGinty, p.96; Harvey and White, p.104. 173. 173Younger, p.402; Brunicardi, p.33; Neeson, p.225; MacGinty, p.96; Harvey and White, pp.104-105. 174. 174Brunicardi, p.33; McIvor, p.48; MacGinty, p.98; Harvey and White, p.104. It should be noted that this is an approximate reconstruction of the course of these landings, as virtually every source provides conflicting information. 175. 175Younger, pp.402-403; Neeson, p.226; Harvey and White, p.105. 176. 176Younger, pp.403-414; Neeson, pp.226-229; Harvey and White, pp.105-107.